Dogs and skunks. They go together like peanut butter and jelly, right? At least my dogs think so. We’ve had more than a few run ins with skunks that leave the dogs stinking in a serious way. 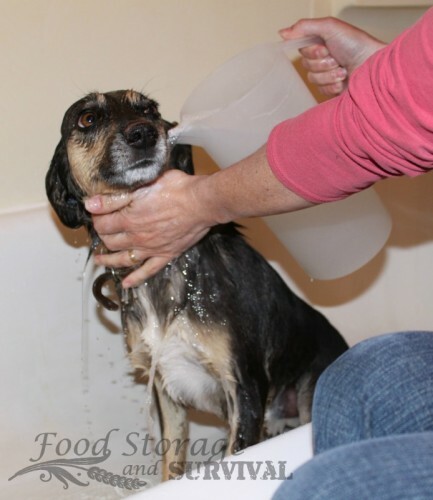 And we’ve tried out more than one method to de-skunk the dogs, including commercial products, tomato juice, and vinegar. 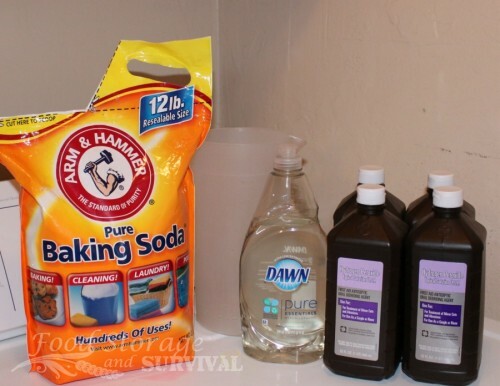 But the one we found that works best AND is cheap and easy is a combination of hydrogen peroxide, dish soap, and baking soda. The good news is, with this method, if your dog gets skunked when the stores are closed, you probably already have the ingredients you need! Here’s the best way to get skunk smell off a dog, featuring the same little troublemaker that needed the honey bandage. 1 quart (32 oz. or approximately 1 liter) of 3% hydrogen peroxide. This is the same stuff you can get in the brown bottle at your local pharmacy. We use it for cleaning scrapes, cat scratches, blood stains, and earrings. Fresh is best. 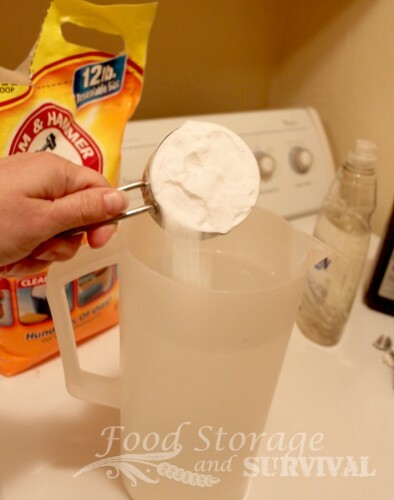 Mix the ingredients together in a plastic container. I used a 2 quart pitcher and did a double batch. Small dogs will only need a single batch. I actually thought I’d be washing two dogs, but it turned out I only needed to wash the smaller one, so I had some left over. Don’t make this mixture up ahead of time, and don’t try to keep it in an enclosed container as it releases gas and could explode your container. Now get your little stinker. If it’s warm out, go ahead and set up outside. 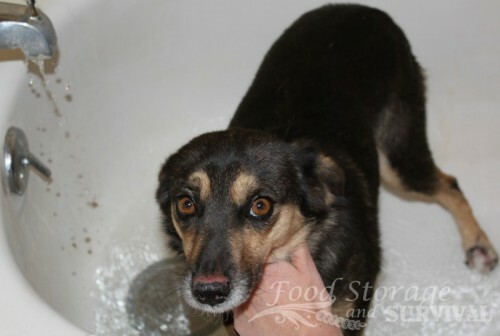 Of course our dog found the skunk on a winter night, so we’re washing in the tub. Get the dog wet. This helps the magic de-skunking solution saturate his fur better. After the dog is wet down, stir the peroxide solution one more time and carefully pour it over him. 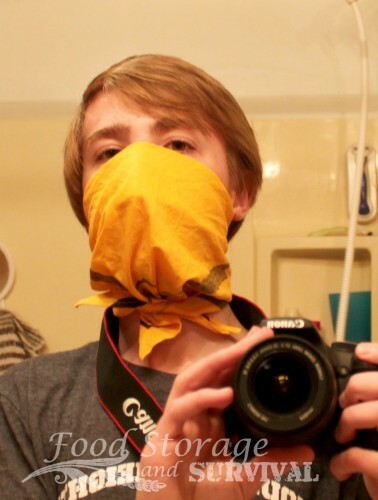 Be very careful around his face and be sure the solution gets on all the rest of him. Chest, belly, tail, toes, everything. Lather it up and work it in a bit. Now, this is important, let it soak for 5 minutes. The magic de-skunking solution is actually neutralizing the scent through a chemical reaction and we want it to have time to work its magic. Here’s a great scientific explanation from a professor of chemistry of what’s happening. After the soak time, rinse the peroxide solution off the dog (while he plots his revenge). 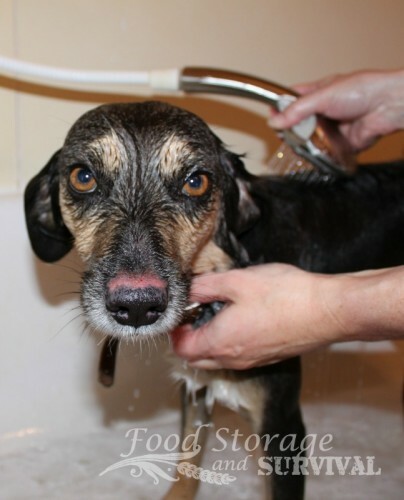 Towel dry or blow dry your dog as you normally would after a bath and you’re finished. 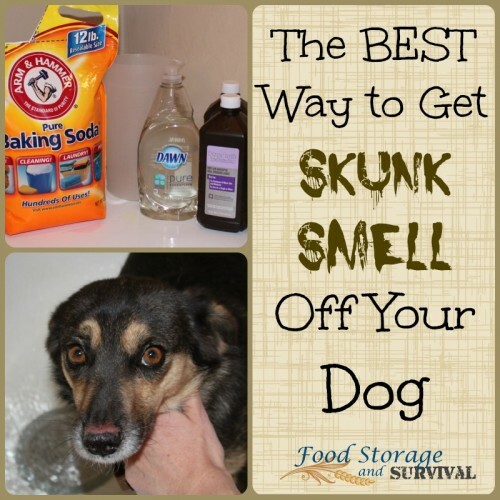 Prepper bonus: all these ingredients store easily in your preparedness supplies, so you can have them on hand for getting the skunk smell off your dog! OMG! YESSSSSSSS IT WORKED IM SHOCKED AND AMAZED! TY I TRIED L THE STUFF U R TAUGHT AS A KID ALWAYS WAS TOLD TOMATO JUICE . IT DID NOT WOTK !THIS WAS AMAZING ! DID IT ONCE SMELL GONE , AND HAD ALL THE STUFF RIGHT HERE ! SOOOO CHEAP!……. THANK YOU!